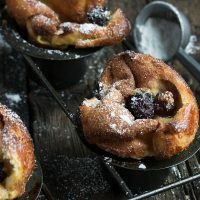 These Sugar Coated Vanilla Blackberry Popovers are lovely for breakfast or brunch, or as a dessert with a scoop of ice cream. 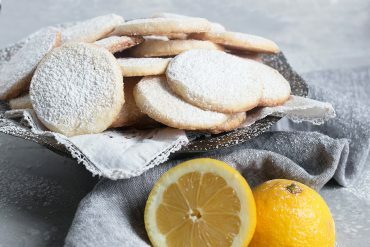 Still looking for a treat for Mom tomorrow? 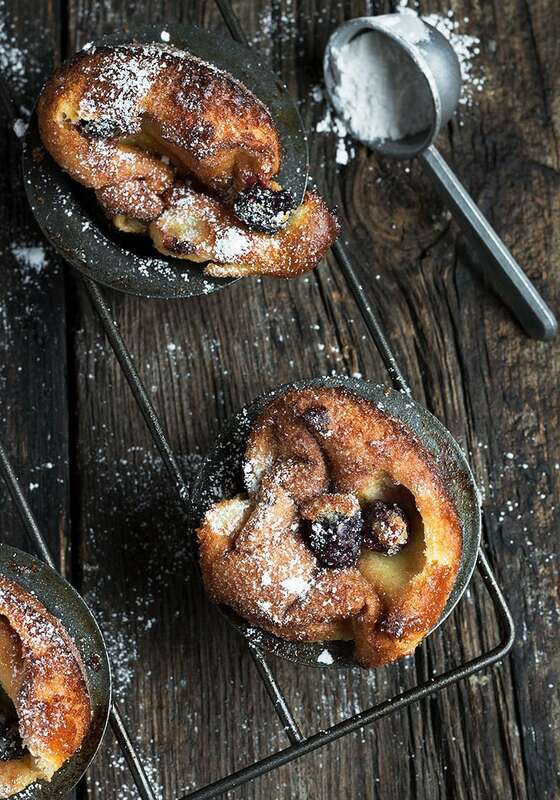 These Sugar Coated Vanilla Blackberry Popovers are a wonderful treat and super easy to make. 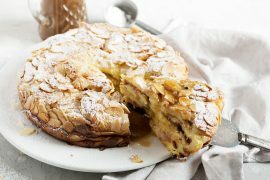 These would make a wonderful addition to breakfast in bed or for a late breakfast as home or as a nice dessert, with a scoop of ice cream. No popover pan? No worries. 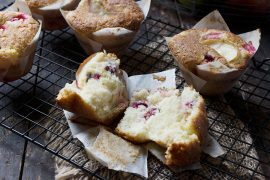 You can make these in a muffin tin as well. Wishing all the Moms a most wonderful Mother’s Day! If you don’t have a popover pan, you can use a regular muffin pan. You will get about 9 small, muffin sized popovers. You could easily substitute raspberries, blueberries or strawberries for the blackberries here. Even though the berries will sink into the batter, as they bake, they will be pushed up to the surface again and will be somewhat loose after baking. Don’t worry if the blackberries fall off as you are brushing/sugaring. Just put them back where they belong. 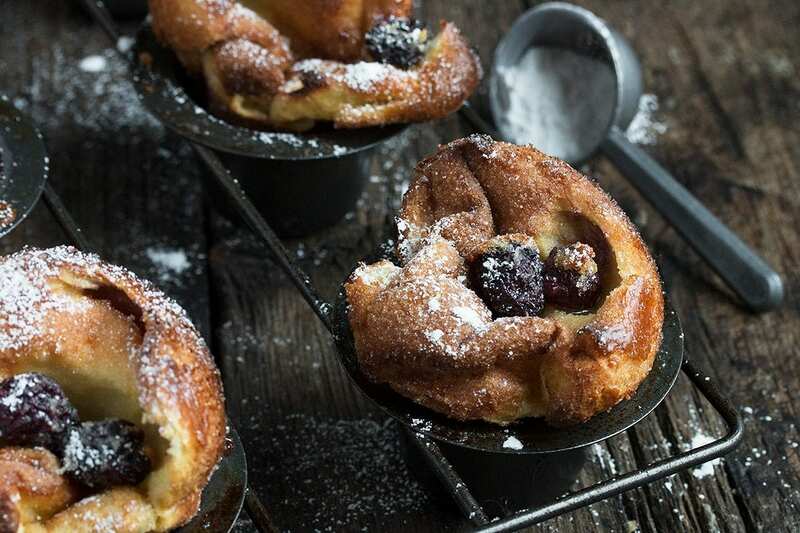 Easy and delicious, these popovers are great for breakfast or brunch or for dessert with a scoop of ice cream. 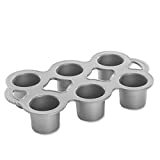 You can use a popover pan or a regular muffin tin, for smaller popovers. You will get 6 large popovers in a popover pan or about 9 in a muffin tin. Preheat the oven to 400ºF. Brush your popover or muffin tin generously with softened butter. Set aside. For the puffs, add the 2 Tbsp melted butter, eggs, milk, salt and sugar in a blender and blend for a few seconds. Add the flour and blend for about 10 seconds, just until smooth. Divide the batter among 6 popover cups or 9 muffin cups, filling each 1/2 to 2/3rds full. 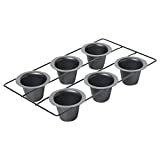 Top with 3 blackberries (or 2 for muffin cups). Bake for about 35 minutes, or until the puffs are deep brown. Remove from the oven and allow to cool in the pan 4-5 minutes, then remove the popovers from the pans and set them on a cooling rack. 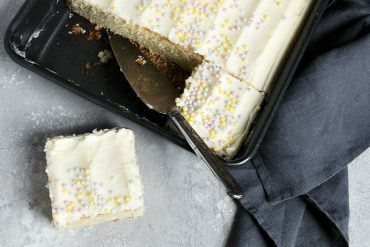 You may need a small knife or spatula to help pry them out. For the sugar coating: While still warm, thoroughly brush each popover all over with melted butter, then sprinkle generously with sugar. Let cool on the wire rack. 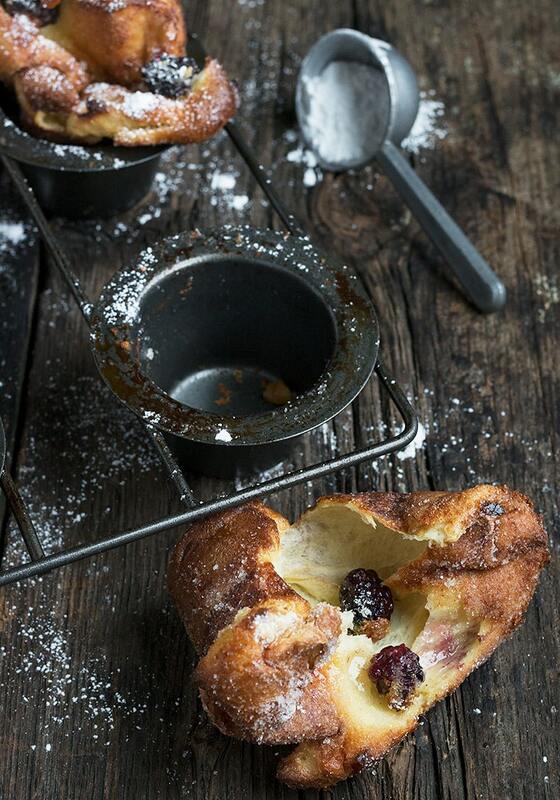 I love popovers and these are the loveliest! 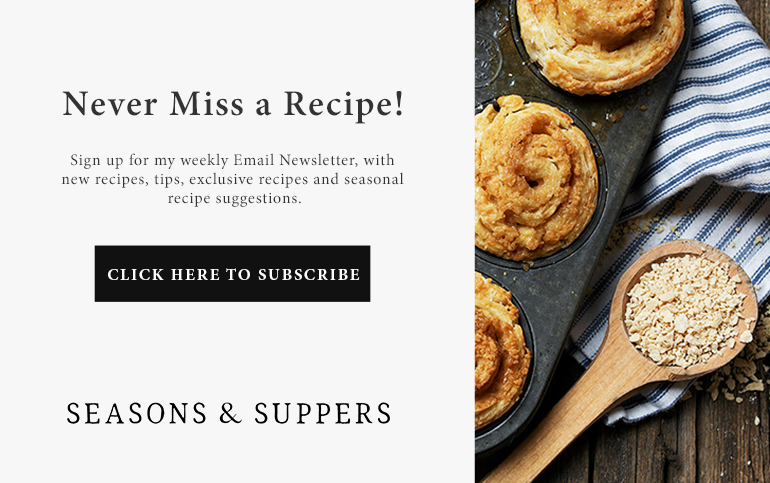 I’ve only had savory popovers topped with onion gravy and I am loving the idea of using berries and a sweet batter. They look incredible, Jennifer! Thanks Milena and I think you would love the sweet version, too! 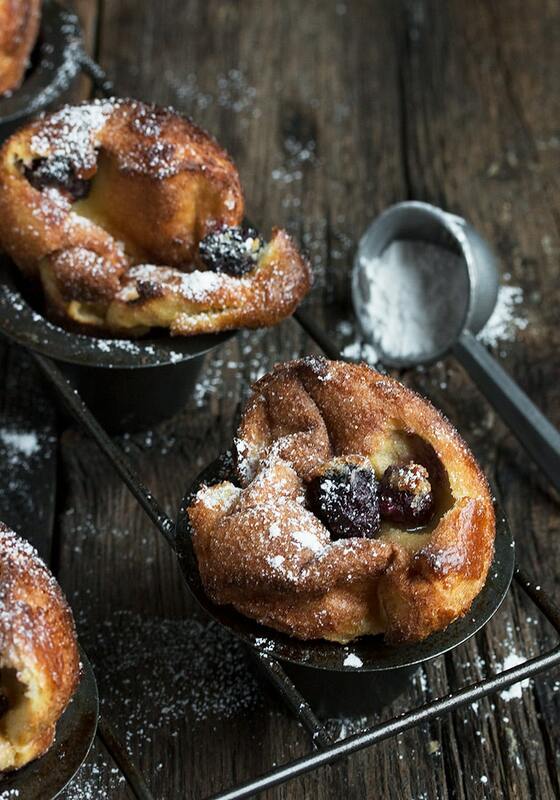 I think maybe I attempted popovers once, on a Thanksgiving when I was living in London ~ it’s been way too long in between and I think these have to happen in my kitchen soon, what a wonderful variation! These look incredibly delicious, Jennifer!!!! I am dying over that vanilla blackberry combination! 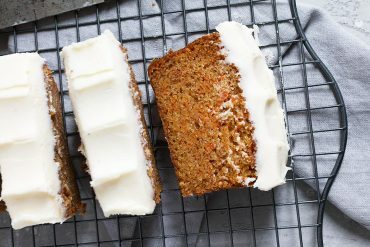 Such a delicious breakfast or dessert treat!!! Cheers! I love popovers, and haven’t made them in a while Jennifer. 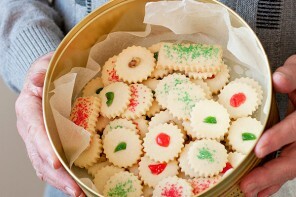 I will need to add these to my baking list. 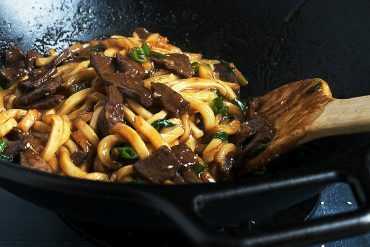 They look wonderful! These look flaky perfect Jennifer – and I just happen to have a blooming blackberry plant in my backyard. Can’t wait to pick fresh berries with my granddaughter. 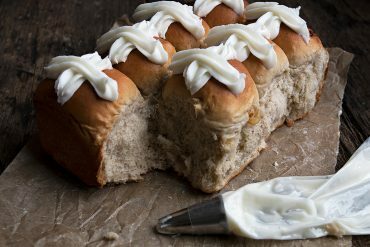 I have a popover pan but rarely use it – gotta try this sweet version soon :) Happy Mother’s Day to you – hope you get to see your children all day!